This is an easy activity to put together for students to enjoy + learn about the different classifications of mixtures: solution, suspension, colloid. To prepare for this activity, you will need some (or all) of the following: Yoohoo cholocate milk (in a bottle), Italian salad dressing, nail polish, milk, Kool-aid, sweet tea, salt water, marshmallow, coffee....the possibilities are truly endless! I do try to use substances that have clear indicators of being either a solution, suspension, or colloid. 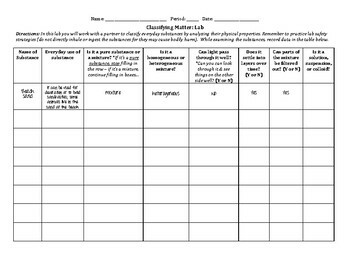 I allow students to work at stations + rotate through the substances with their lab sheet. After all students have finished, we discuss our classifications.